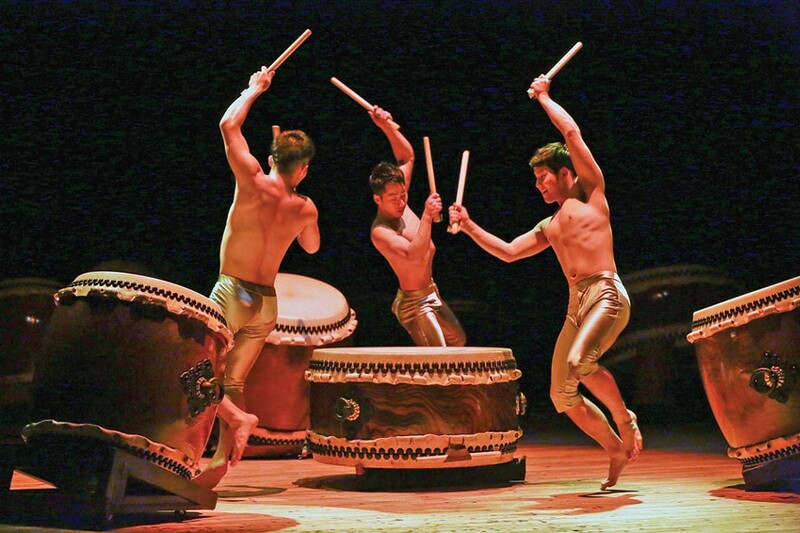 PHOTO BY TAKASHI OKAMOTO The Kodo Drummers will perform as part of the new Eastman Presents series. Comedian Jason Alexander, Broadway star Bernadette Peters, and the Vienna Boys Choir will also be featured. The Eastman School of Music is expanding its performance offerings in its 2014-15 season, adding a new series that will include comedian Jason Alexander, Broadway star Bernadette Peters, and the Vienna Boys Choir. The new series, named Eastman Presents, will also include appearances by pianist Peter Serkin, the Kodo Drummers, and Cuban jazz trumpeter Arturo Sandoval. Tony Award winner Jason Alexander -- perhaps best known for his role as George Costanza on "Seinfeld" -- opens the series on October 17. The programs will take place at Kodak Hall at Eastman Theatre, once a month through April, with the exception of January. The new series is part of the school's plan to again be "a major presentation venue in the country," says Keith Elder, the Eastman School's director of concert activities. "In the early half of the 20th century, major organizations would come through here. This is strategic to bringing international artists back to Rochester." Eastman announced the new series Tuesday, along with the line-up for two of its other series. The four-concert Eastman-Ranlet series in Kilbourn Hall will begin October 5 with the Dover String Quartet, Grand Prize winners of the 2010 Fischoff Competition. The nine-time Grammy-winning Emerson String Quartet is set to perform in February. And the Eastman's quartet-in-residence, the Ying Quartet, will perform its traditional fall and spring concerts in November and February. German violinist Christian Tetzlaff will open the Kilbourn Concert Series on September 16. Tetzlaff performed with his quartet during last year's series, and returns as a soloist. Also in the Kilbourn series: the Toronto-based piano group Gryphon Trio; the energetic Third Coast Percussion; and mezzo-soprano Stephanie Blythe joined by pianist Warren Jones. Season subscription sales for Eastman Presents, Eastman-Ranlet, and Kilbourn Concerts begin May 2. Packages for the six Eastman Presents performances range from $106 to $408. The Eastman-Ranlet or Kilbourn Concert Series range from $55 to $80. Subscriptions to both the Eastman-Ranlet and Kilbourn series ranges from $94 to $140. Those series can be discounted with a UR ID and subscription renewals. Single tickets go on sale September 2. Tickets can be bought at the Eastman Theatre Box Office (433 East Main Street), by phone at 454-2100, or online at Eastmantheatre.org. Friday, October 17: An Evening with Jason Alexander, 8 p.m.
Sunday, November 2: An Afternoon with Arturo Sandoval, 3 p.m.
Thursday, December 4: Christmas from Vienna with the Vienna Boys Choir, 7:30 p.m.
Saturday, February 21, 2015: Eastman Philharmonia with Peter Serkin, 8 p.m.
Tuesday, March 3, 2015: The Kodo Drummers. One Earth Tour: Mystery, 7:30 p.m.
Saturday, April 25, 2015: An Evening with Bernadette Peters, 8 p.m.